Libong Island is located in Trang Province, on the southwest coast of Thailand, on the Andaman Sea. Ko Libong is a small island of 9 km across and with a total area of approximately 40 km2. In 1999, due to its pristine natural condition and wide variety of habitats and wildlife, the island was declared the Ko Libong Non-hunting Area under the auspices of the National Park, Wildlife and Plant Conservation Department (formerly a part of the Royal Forest Department). Mangrove forests, seagrass beds, and coral reefs are major coastal features of the island. Coral reefs, which occur as shallow-water fringing reefs developing down to two to four meters depth, are distributed along the west and south coasts of the island. 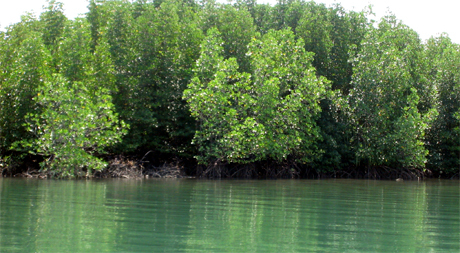 Mangroves, chiefly Rhizophora apiculata, fringe most of the wave-protected coastline, especially in the northern and southeastern parts of the island. Extensive intertidal sand flats, sand dunes, and patches of seagrass extend out from these wave-protected areas. Of the ten species of seagrasses found in the area, Halophila ovalis and Enhalus acoroides are among the most common, with H. ovalis widely distributed in both intertidal and subtidal zones and E. acoroides dominant in the subtidal zone. This field guide highlights coastal fishes associated with mangroves and seagrass beds of Libong Island. In addition, a few lots of fishes collected from mangrove creeks near Pak Meng, the place where our research team was based during field trips, are included here. Fishes were collected mostly by beach seine at most sampling sites along mangrove creeks and in subtidal seagrass beds. 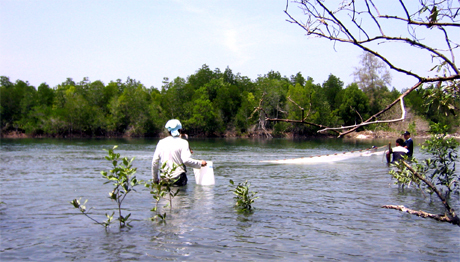 Hand nets were also used to collect fishes from tide pools in exposed seagrass beds and to collect small bottom-dwelling fishes from small tributaries in the mangrove forests. Fishes taken with gill nets by local commercial fishermen of Libong Island are also included. Seining in seagrass bed at west coast of Libong Island. 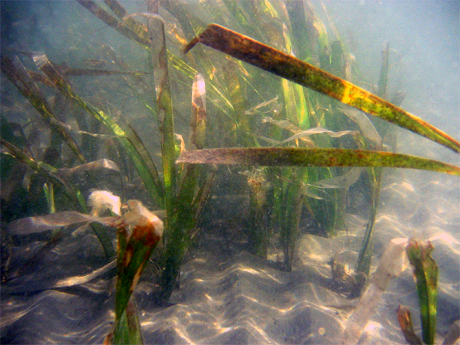 Seagrass bed at west coast of Libong Island. Mangrove creek in Libong Island. Seining in the mangrove creek. 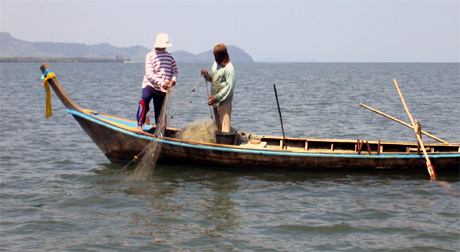 Gill net fishery around Libong Island.